[Update – added PDF] What’s up everyone? 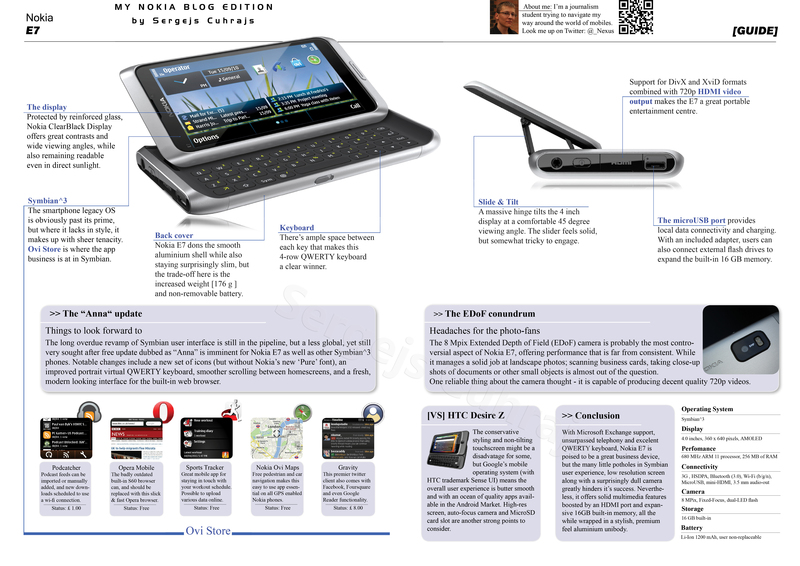 I’d like to present here my little pet project I’ve been piecing together in my spare time… a visual guide to Nokia E7. The idea is to offer a quick overview of the important aspects of the device without delving too much into the details. I’d also like to expand this on to my future reviews that would cover more comprehensive info while still retaining the compact, easy to read, nature of the guides. This first guide was more or less a training to learn my way around basics of inDesign, and hopefully following projects will be done at a much quicker rate! Now, what I need from you, dear readers, is tell me things you liked, and, most importantly, what in your opinion needs to be improved or added. With the help of your feedback, I’m hoping to bring more expansive, interesting guides (and reviews) to you in the future. Thanks a lot!